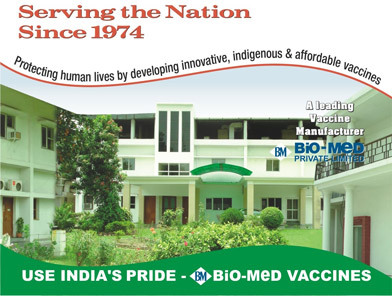 Bio-Med embarked on its noble mission of producing world-class vaccines essential to the needs of a developing country. India, with its tropical climate is quite prone to a number of diseases that sometimes assumed epidemic proportions in the past. Initially, most vaccines had to be imported at the cost of nation’s self pride with a considerable foreign exchange outflow. With this background in view, the foundation stone of Bio-Med was laid on May 11, 1972. Bio-med is located in the National Capital Region of India ( Approx 50 Km from IGI Airport , New Delhi). It has built up area of about 150,000 sq.ft which houses dedicated facilities for all the vaccine manufacturing, Quality Control Laboratories etc. The manufacturing facilities have been designed, maintained and certified to be of cGMP standards. The physical working environment is completely modernized and compares well to international standards.